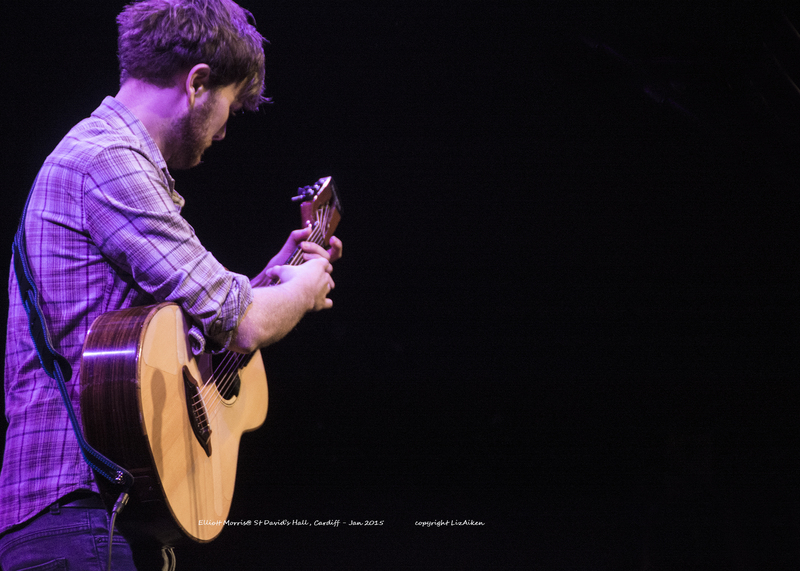 Supporting Paul Carrack on the tour is Elliott Morris, a young solo acoustic artist who delivered a stylish set. His voice is powerful and he engaged with the audience with funny tales and setting the context for his songs which were a mix of folk and country tinged with blue. The numbers were self-penned full of clever lyrics, this is a songwriter who understands the power of the story, he has been influenced by Michael Hedges and Eric Roach which shone through with his percussive acoustic guitar playing. He delighted the audience they were charmed and entertained the perfect warm-up act for Paul Carrack, with his charismatic approach as he delivered songs which included Courting For Pleasure and Something’s Got To Give and if you see him playing live locally check amiable Elliott Morris out; he has a new E.P. It Seemed to Make Sense at the Time; release date 2nd March 2015. 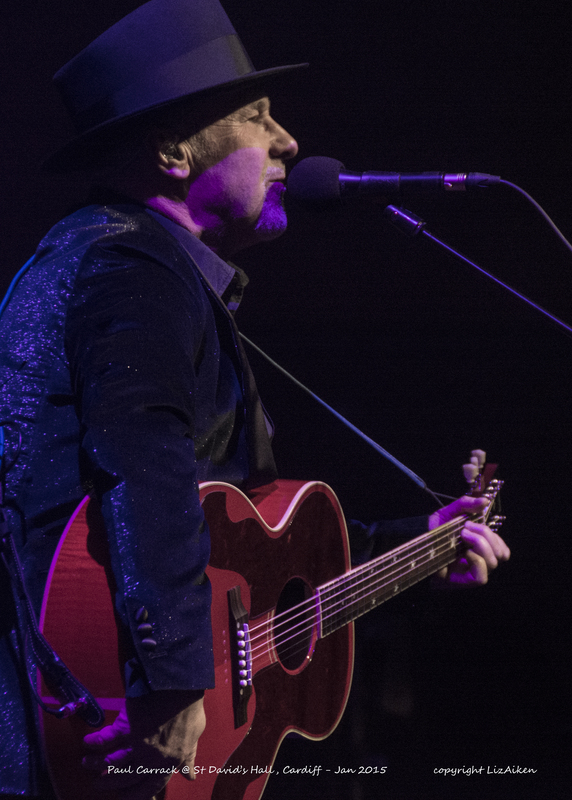 Paul Carrack stepped onto the stage with a resounding cheer from a full house who were looking forward to hearing the man once again deliver the music they love whether from his long career from Mike & The Mechanics to Squeeze and beyond including in his latest album Rain or Shine tonight in Cardiff. Opening with Satisfy from behind the keys on his Hammond C, Paul and his band captivated the audience and collectively they knew it was going to be a magical and musical carpet ride tonight at St David’s Hall, just the upbeat sound we all needed to hear on a dark January night. Then, picking up his red acoustic, Paul delivered Walk in the Room, with pieces of chatter we were now sitting back in our seats and enjoying the event. One in a Million from his Rain or Shine album was followed by a story inspired by his daughter setting off travelling All That Matters, these little personal insights make the evening so much more than a few songs delivered it is what makes live entertainment real and special. With his six-piece band adding layers of sounds, with guitar, saxophones, keys, bass with the two drummers making different but harmonising into a complimentary percussive beat that never drowns out the vocals. This worked so well on Time Waits For No One with the delightful solo’s adding texture and tone and on the track The Eagles covered Love Will Keep Us Alive. As the songs and music kept rolling through the auditorium the reception grew more excited as they heard or hoped for the numbers special to them from Paul’s extensive discography. 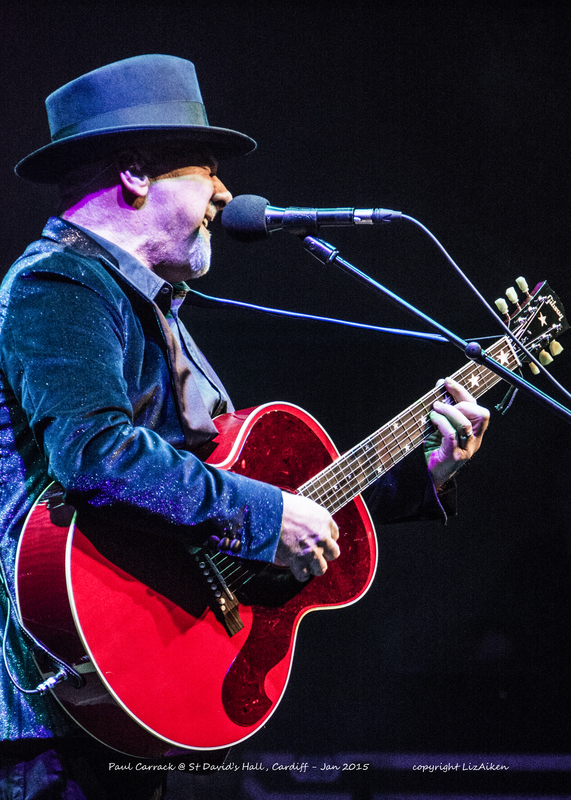 It would not matter how many great musicians Paul Carrack had around him it is always about the songs at a Carrack concert and he always delivers with the right emotions and delivering the words so they have their hidden depths revealed. The lighting tonight had the musicians in darkness making them meld into the background creating an atmospheric platform for Paul to perform in the spotlight. We were all treated to a fantastic rendition of one of my favourite Mike and The Mechanics numbers, Living Years with the added bonus of quality backing vocals. The number the musicians seemed to enjoy playing the most was Make your Mind Up with plenty of instrumental interchange almost creating the feeling of a jam with the keyboard player taking the lead on the vocals and the audience had a chance to participate and they did this with enthusiasm. Brenda Lee’s; I’m Losing You was showcased tonight with Paul’s unique warm tones adding layers of feeling his vocals sparkle and shimmer it is why people will always return to a Paul Carrack concert seeing him perform live is an event where every emotion is explored but you know you will go home uplifted even if this time your personal favourite is not on the set list. Ending with Life’s Too Short, should be the motivating call for people who love music to get out and see live music whenever they can; because the atmosphere if tonight is a litmus test is electric and energising.